Since its release two years ago, the anonymous, secret-sharing app Whisper has become hugely popular. Today, it reaches 3.5 billion page views per month. Although Whisper’s main demographic is comprised of 18-24-year-olds, there are still a number of teens using the application. Given its steady increase in popularity, many more teens are expected to join. When you open the application for the first time, you are taken directly to the popular page home screen. Without the need to register, you can start posting secrets, which are referred to as “Whispers”, right away. 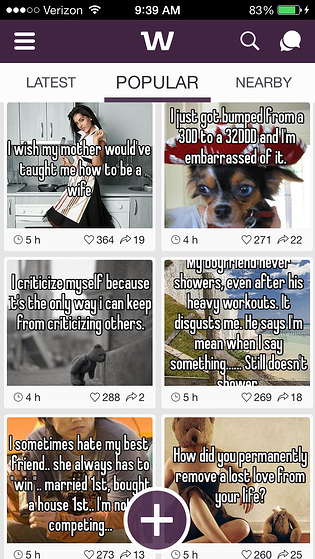 Since there are no user profiles on Whisper, it is technically not considered a social network. However, it acts as one when it’s utilized to communicate with fellow users. People can interact on Whisper in two ways. Users can reply to Whispers with Whispers, which are then publicly displayed under the original post or they can exchange private messages. The private messaging feature comes as a great concern, because predators are able to seek out teens in order to engage them in sexting or other dangerous activities. Since the application also allows users to see posts within the 25 mile radius of them, preying on teens and looking for hook ups becomes increasingly easier. This is exactly what happened to a 12-year-old girl from Seattle last year, and a 16-year-old girl from Austin earlier this month. Both were assaulted and raped by men they met through Whisper. In order to find out what people are using the application for, I created a Whisper of my own, asking just that question. The answers varied from,“ I can’t keep this secret to myself, nor can I share it to someone I know in real life, so I breathe to Whisper and feel the relief and keep my reputation intact” to “Getting nudes of hot girls”, “Sexting”, and “For hookups”. One of the replies we received was from a 15-year-old claiming that he or she uses Whisper in order to meet new people. Most replies were too explicit to include here. One thing that can be concluded is that Whisper is here to stay. People are interested in having an outlet that lets them anonymously express themselves. However, just like with any other network, there will be cases of cyberbullying, sexting, people looking for hook ups, and explicit content. What can parents do to ensure their teens’ safety on the app? There is no easy answer, and ultimately it comes down to two factors. Firstly, parents must have a clear understanding of what the app is and how it is used. Parents may want to download and use the app in order to gauge the safety of Whisper. Secondly, after parents have a good grasp of the app, they should have a conversation with their children. Explain the potential dangers of the app with your teens and provide examples. Tweens and teens are more inclined to listen to their parents on subjects such as technology, apps, and social media when they know that their mom and dad are technologically aware.